-Play Death Match and earn Batman for free! Event Rules: Simply collect enough Event Icons and redeem them for Batman. 1.Log in from 5/28 to 6/10. 2.Play Death Match on Fri, Sat, & Sun. 3.Complete Death Match quests (e.g., play X total matches, rank top 3 in X matches, etc). More details will be announced when the patch goes live. Have fun! 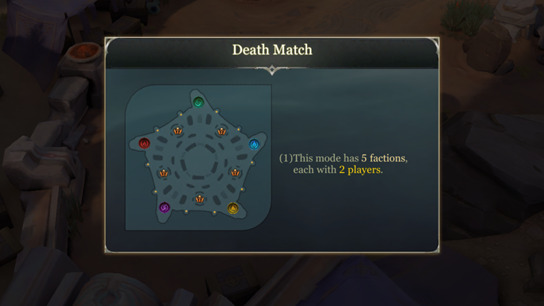 In this all-new mode, we will break the format of red versus blue, and increase the number of factions in battle to five! 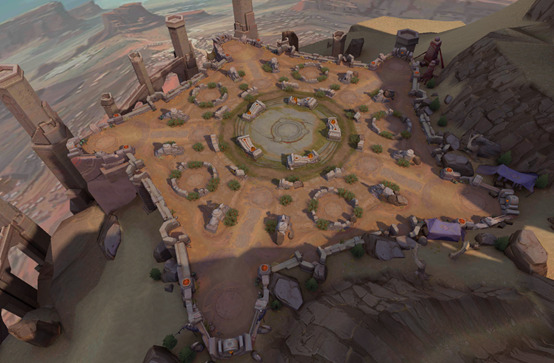 Unlike the conventional Antaris Battlefield map, there are different spawn points belonging to the different factions on the map, as well as different stage events that occur at fixed intervals. 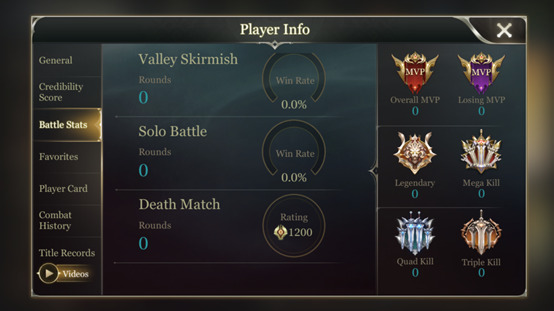 Once it’s available, you’ll be able to access Death Match within the Casual Match menu. Five teams face off against each other on the battlefield. You gain points by defeating heroes from the other factions. The timer for the stage is fixed at 8 minutes. Once the 8 minutes are up, the teams are ranked according to their total scores, and the map scores are shown from 1st to 5th. The higher ranked factions are shown on the left. Note: There are only two players in each team for Death Match, so higher levels of cooperation between teammates is required in this mode. 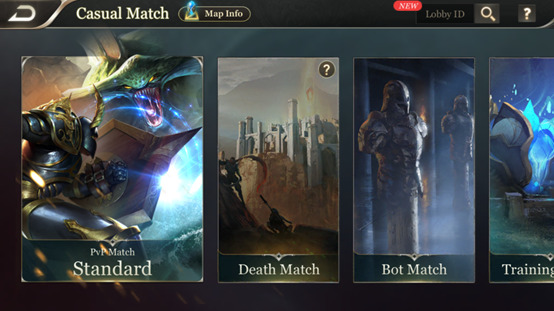 Now, let's follow a single match to analyze Death Match gameplay. There will not be many additional resources available on the map. You can enter the jungle on the outer edge of the map for leveling. Elemental Stone monsters will spawn in the jungle at the start of the match. 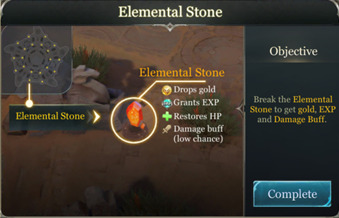 Elemental Stones will not retaliate or move. You will earn EXP and Gold for defeating them, with a low chance of receiving an attack buff. If you are lucky enough to get the attack buff, quickly look for other players to fight! Elemental Stones are represented by yellow dots on the mini map. Multiple golden buff circles of random sizes will appear at random locations in the central area of the map. 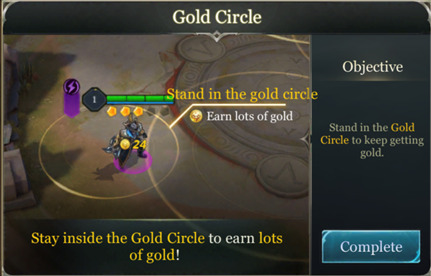 Standing in a buff circle will allow you to continuously earn Gold, and standing in areas where buff circles overlap will give you double the Gold. The location of these buff circles will change after each fixed interval. At the same time, Elemental Beast monsters will spawn at random locations in the central area. Elemental Beasts are small monsters that carry magic stones on their backs. They are too short to attack, but touching them will make them drop their magic stones and run away, netting you a large amount of Gold. 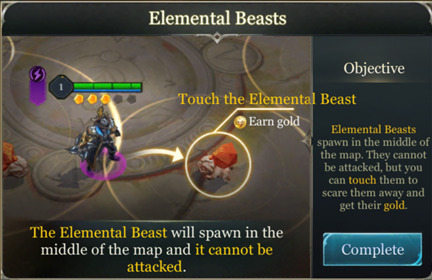 1) Try to enter the central area 1 minute after the start of the match and compete for Gold from Elemental Beasts and buff circles to gain an economic advantage. 2) This is also a chance to get some kills under your belt (additionally, standing in the areas where Gold Circles overlap will give you more Gold). 3) Of course, with great reward comes great risk. The vision in the central area is exposed to all players! As shown in the image, standing in a Gold Circle will give you Gold periodically. The monster shown in the image is an Elemental Beast. You can't attack it, but touching it will make it run away and you will obtain a large amount of Gold. At fixed intervals, a total of five buff monster points on the map will randomly spawn two large Immortal Golems. 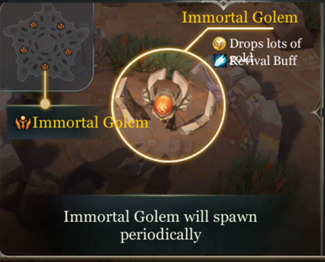 Kill an Immortal Golem to receive a large amount of Gold and a 60-second revival buff. During the 60 seconds, the hero will revive on the same spot with 70% of Max HP 2 seconds after death. Tips: Pay attention to the warning that will appear at the top right corner of the mini map and screen before the Immortal Golems spawn. The Immortal Golems also will not retaliate. Find a good time to defeat the Immortal Golems to gain an advantage in battle for the next 60 seconds. The team who is in first place will enter the Encircled state, and their vision will be permanently exposed to the other teams. Clear Wanted markers will appear beneath the feet of these heroes and on the mini map. This is the phase when the Death Match really starts to heat up. The Encircle button will appear on the screen for the other teams. Tapping it will send out a request to help encircle. Everybody should try to encircle the team in first place to restrict their points. 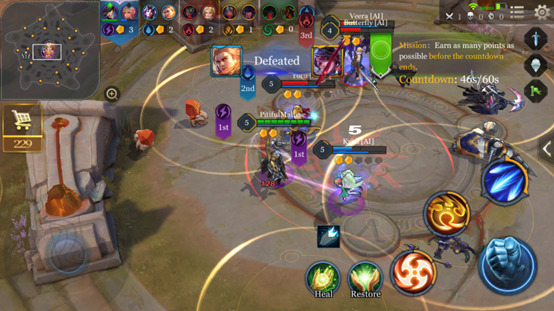 You should aim to find a chance to kill the enemy with the highest score in the resulting skirmish. Q: The team in first place is too strong. What do we do if the difference in our points is too big? Killing enemies in a row will cause the score that appear above your head to continuously increase. You can interpret the score above a hero's head as the current value of the player. 1.Each player has 1 point at the beginning. 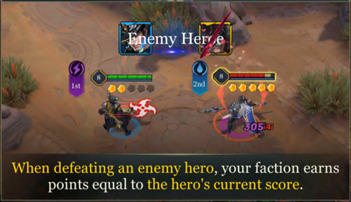 2.Killing an enemy adds 1 point to your total. 3.When you kill an enemy, the score above the enemy's head will be added to your faction's score. 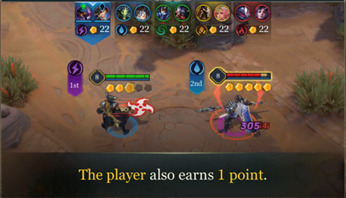 For example: If there are 3 points above the enemy's head, 3 points will be added to your faction's score when you kill the enemy, and 1 point will be added to the score above your own head. 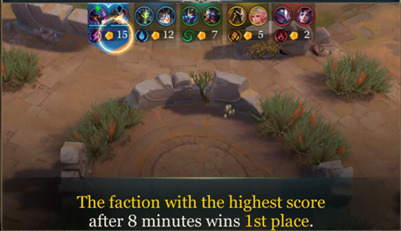 No points are deducted from the faction when you die, but the score above your head will return to 1. As such, during Death Match, make sure you go after enemies with high scores. This not only limits the enemy, but is also fastest way to increase your score. Q: What should I do if the enemy keeps hiding in their spawn point during the Death Match? What should I do if the enemy corners me in my spawn point? In a Death Match, there are no altars, but every player will be given two HP packs that restore a large amount of HP. These are refreshed every 45 seconds. Hiding in the base without coming out will not get you anywhere. In a Death Match, you will receive an invincibility buff that lasts for 10 seconds after respawning. What do you do if your team is cornered in your spawn point? No problem. You're invincible, so fight back! Take note! The invincibility buff will disappear as soon as you leave the base. Q: There are so many factions in Death Match. How do I tell the difference between enemy factions and my teammate? In Death Match, apart from your own faction, the HP bars of all enemies are red. Pay attention to the special effects circles under the feet of all heroes. The color of the special effects represents their faction. The faction logo is also displayed next to their HP bar. 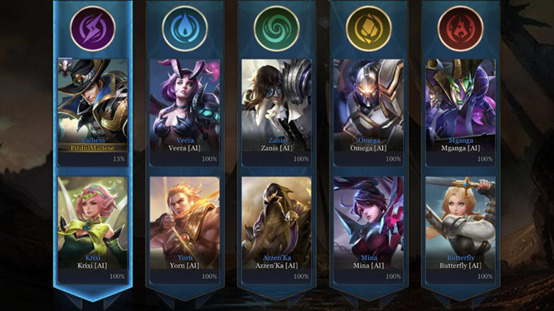 Note that the two heroes with the same color and logo are from the same faction. As well as this, there will be a line in your faction's color connecting you and your teammate. This makes it easier to locate your teammate quickly. Q: My team is at a disadvantage. If we're afraid to get into a teamfight, how do we gain points? A: We have added the special Snipe skill for all players. Snipe has a cooldown of 25 seconds. It has a shooting range of the whole map, and has Slay effect if it hits an enemy hero. Snipe also has the ability to probe vision. It will expose the vision of enemies near its flight path. 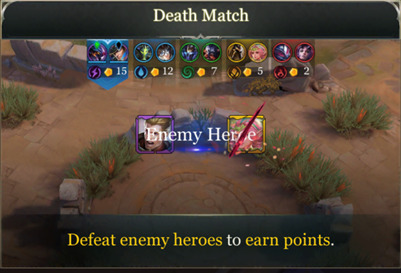 Q: Won't heroes who aren't suited to teamfights or one-on-one fights not stand a chance in this mode? A: We've included a balancing mechanism in this mode. You should try using every hero. Some heroes might even prove to be stronger than you expected. 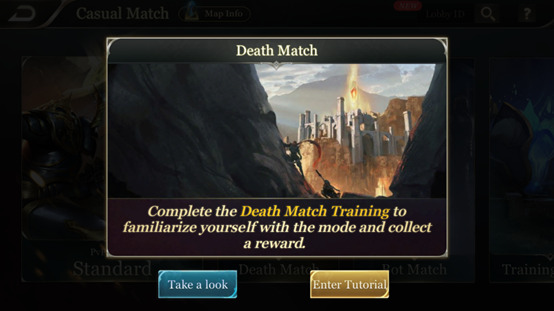 As Death Match is an all-new mode, we have created a dedicated tutorial stage. Clearing the tutorial stage will help players quickly get to grips with the basic rules of Death Match and learn the secrets to winning. 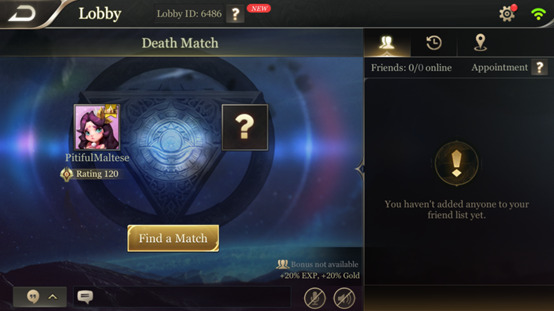 When accessing Death Match, a notice will pop up asking players if they want to play the tutorial stage. Death Match gameplay is a completely different from Antaris Battlefield, so we strongly suggest that all players complete the tutorial stage before venturing into an actual battle. The Death Match tutorial stage gives detailed explanations of new features such as Gold Circles, Elemental Beasts and Elemental Stones. This will help players get to grips with the rules and gameplay more quickly. 1.The first kill in Death Match yields more Gold compared to other modes. 2.When a hero's avatar turns red on the mini map, it means that this person has very little HP remaining. You can use Snipe to finish them off. 3a.During the match, select Faction Mode from Settings - Interface. 3b.This switches the color of the HP bar to match the color of the faction. For example, the HP bar color of the Green Faction is green. We have created a cool tallying animation for Death Match. Now, the cute elemental guardians will cheer your victory. Do your best to win 1st place and show everyone what you're made of! Added a new display to the Personal Information page.